The Ibanez 2017 RG1070PBZ Premium Electric Guitar is an outstanding model that benefits from decades of Ibanez expertise. From the seamless composition of woods that are suited to the sleek RG body profile and neck design, to the intricately nuanced pickups that burst forth with an envious tonal palette, this is a refined model for the discerning guitarist. Not only that, but it looks pretty awesome too. The ergonomically designed RG body shape offers one of the most comfortable playing experiences that any guitarist will enjoy. With deep double-cutaways for improved upper fret access, softly contouring body bout for a relaxed resting position for the picking arm, and a slender, lightweight body depth that makes it a joy to perform with, the RG1070PBZ is a beauty. The RG1070PBZ has been crafted using American basswood to guarantee a lightweight yet resilient feel in the hand, whilst delivering a sonic energy with a defined midrange. Married to the body is a sophisticated poplar burl top, which is completed with a stylish finish to enhance the visual aesthetic of this extraordinary model. Firmly fitted to the body of the RG1070PBZ Premium guitar is an 11-piece wenge/bubinga/maple/purple heart neck. The neck is shaped with a slim grip profile that contributes to the neck superb rigidity, affording the guitar greater sustain. Paired with the neck is a luxurious wenge fingerboard with stainless frets that are known for their bright tone. The luminescent side dot inlays make it easier to quickly check your position on dark stages. The fingerboard has been treated to Ibanez' unique Premium fret edge treatment, ensuring seamless transitions between frets for a playing feel unlike any other. 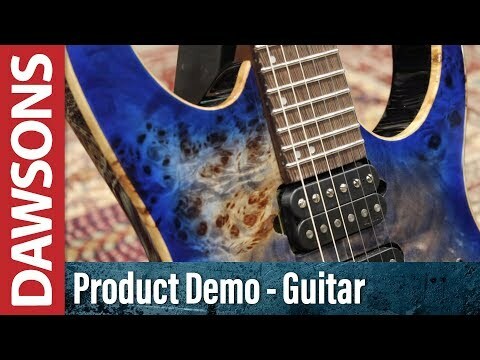 To enable you to make the most of the adaptable tones at your very fingertips, Ibanez have fitted a trio of DiMarzio pickups to the RG1070PBZ Premium guitar. In the neck position is an "Air Norton" humbucker, which is accompanied by a "True Velvet" single-coil in the middle position, and "The Tone Zone" humbucker in the bridge position. This triple threat produces warm, balanced dynamics, but also ensures that you can achieve a high output with depth and clarity. Whether you want subtle fingerpicking or huge chords, this setup offers an exceptional arsenal of tones to draw from. The body of the RG1070PBZ Premium is equipped with an Edge Zero II tremolo bridge, which establishes a secure connection between the strings and body to improve intonation and sustain and overall tone. Not only that, but the tuning stability is remarkable given the elaborate vibrato gymnastics that can be performed with this awesome bridge. The built it ZPS3Fe Zero Point System allows the spring tension of the strings to be adjusted via a thumbwheel, eliminating the need to carry a hex wrench around with you for quick fire attenuation. Gotoh MG-T Locking machine heads are fitted to the headstock to provide accurate tuning integrity for each string. The machine heads are finished in Cosmo Black, which makes them stand out against the curly maple fingerboard, and the headstock finish. The Ibanez 2017 RG1070PBZ Premium Electric Guitar is supplied with a soft case to protect your new model at home and on the move.